On August 12, Lieutenant Colonel Frank Goettge, senior officer of D-2 Intelligence, set out from Kukum at 6 p.m. in a Tank Lighter craft, somewhat bigger than a Higgins boat, witih twenty five officers, scouts and infantry men. Most of these men were from the Intelligence sections of the Division and Fifth Marines. A Regimental surgeon, Dr. Pratt, also accompanied the party. Colonel Goettge's ultimate aim was to achieve a possible victory for the Division and bring land operations on Guadalcanal to an end by giving the enemy the opportumty to surrender. He brought Lt. Ralph Corry, who was proficient in Japanese, with him. He had worked in government service in Japan prior to the war and would be an ideal man in this situation if the Japanese soldiers offered to lay down their arms. A Japanese naval warrant officer, who had been taken prisoner, indicated that there were many men who would surrender if they had the chance. They were wandering aimlessly in the jungle without food. There were also wounded men needing medical attention. Another prisoner gave a very similar story. A report also came from the Marines from the Matanikau line that they believed they saw a white flag flying inland from Point Cruz. There had also been Korean laborers who had come through the lines and surrendered. Colonel Goettge felt these indications were sufficient evidence to warrant immediate action. No time should be wasted in capitalizing on this situation. If a surrender did not eventuate then a plan outlined by First Sergeant Steven Custer would be followed. A patrol would make a reconnaissance of the Matanikou region, starting near the mouth of the river. When this was accomplished they would begin to move southward. A one night bivouac at a vantage point in the hills overlooking the river would be secured. The next day the patrol wouldcontinue following the Matanikau upstream, then move eastward toward the Lungga in the afternoon. They would bring in any prisoners who surrendered, as well as determine the strength and disposition of the enemy in this entire sector. The patrol planned to enter the Marine perimeter before dusk on the 13th. Just before the patrol departed from the 5th Marine Regiment Command Post, Colonel Whaling, the 5th's executive officer, warned Goettge and Captain Ringer to stay clear of the ground between the Matanikau and Point Cruz. The Japanese were defending this particular section very aggressively. A landing west of Point Cruz was recommended. The sun was beginning to set on the western horizon. There is little twilight in the tropics and darkness was soon upon them. At sea they saw a signal flare to the east. Goettge took this as a warning to return. He ordered the Lighter back to Kukum. When all was clear the patrol embarked once again. It was 9 p.m. Because so many unknown factors lay ahead of them, several men aboard were a bit edgy about starting out at this late hour. As they approached the shore it was extremely dark. There was no moon out. When the darkening shadows of the trees came into view Colonel Goettge instructed the coxswain to beach the craft. Before reaching shore, they ran aground on a sandbar protruding from the delta of the river. The coxswain shifted the engine into reverse gear and gunned the motor Marines got out and pushed and rocked the boat and finally she was free. This episode would have alerted any enemy in the area. Just on the west side of the Matanikau's estuary they went ashore. It was shortly before 10 p.m. This was the very place of which Colonel Whaling had warned them to stay clear Two hundred yards from the shore was an elevated rise in the terrain of approximately two hundred feet. It was a rugged coral ridge named Vayaya. The Japanese shore patrol heard the landing craft and immediately informed their command. Infantry men and their weapons were positioned near the base of the ridge and ready. Colonel Goettge gave instruction to his men to establish a defense cordon at the beach while he, Captain Ringer and First Sergeant Custer set off to find a bivouac for the night on the ridge. Goettge led the way. Shortly after the three men left the beach area, Goettge was cut down by one rifle shot; then machine gun fire cut loose. Custer was seriously wounded. Ringer helped the First Sergeant reach a protective position back on the beach. Not knowing if Colonel Goettge was dead or alive, Platoon Sergeant Few, Corporal Spaulding and Sergeant Arndt volunteered to go and bring him in. Upon reaching the Colonel, Few saw that he had been hit in the head and killed instantly. Removing his heavy wristwatch and insignia so that the enemy would not know his rank, they began to make their way back to the high water point at the edge of the beach. Before reaching their destination, they were attacked by Japanese soldiers. Few thought his assailant was an American, so in disgust he barked out, "What's the password?" In response he was bayoneted in the arm and leg. A struggle ensued and Few was able to wrest the enemy's weapon and bayonet him. Before reaching the beach, Few killed another attacking soldier with Arndt's 45 pistol. His own Reising gun malfunctioned because sand had got into the breach. At the beach Captain Ringer took charge. He established a left and right protective flank. Captain Ringer asked Sergeant Arnt to send an S.O.S. by firing three sets of tracershots simultaneously this command was carried out immediately. Amdt fired his Reising gun and the tracers were seen and the shots heard back at Kukum, but they were puzzled as to their meaning. The Japanese were pressing an attack on both of their flanks. Captain Ringer knew that they needed reinforcements or they wouldn't survive. In discussing their situation with Platoon Sergeant Few, the Platoon Sergeant recommended that they send Sergeant "Monk" Amdt for help. He was tagged this nickname at Calebra, Puerto Rico in '39 when he climbed a coconut tree to get some nuts. The name stuck, He was as agile and spry as a monkey. "If anyone can get through, it'll be Amdt," Few said. Soon the small tough sergeant from Mississippi, who always responded to a challenge, slipped into the water and was on his way. It was around 10:30 p.m. Lungga Point was five miles away. The enemy occupied much of the territory. Arndt knew this, but the only thing on his mind was to get through. Amdt stayed close to the beach, about twenty yards out, because he still had his boondockers on. He couldn't get them off. In the excitement of his anticipated mission he had tied them into knots. In several places Amdt slipped on the reef and was tossed about by the waves. His body was badly cut and bruised by the jagged protrusions on the coral reefs. Tiring, he made for the beach to rest. Much to his delight he found a damaged dugout canoe. Although the bow had been destroyed by shell fire he discovered that by sitting in the stern, it elevated the open end above the sea water. Using a board, he paddled over two miles to the Lunga Boat Pool. It was where they had embarked. Amdt arrived at 5 a.m. Sympathetic sailors wrapped him in a blanket then took him ashore in a landing craft. After giving the password, "Lillian," to the shore guard, he went to headquarters and reported the patrol's dilemma. There was little that they could do while it was still dark without compounding the problem. Back at the patrol the Japanese were increasing their pressure at the extremity of their flanks. A platoon commander named Sakura, had been given the task of annihilating the Americans. Marines were being picked off one by one. First Sergeant Custer was critically wounded. Dr. Pratt was caring for him, but had also been hit. Shortly after, the Doc was wounded again in the lower back and died as a result. Sakurai sent up flares so his men could get a clearer view of the Marine position. It was still very dark. The flares resulted in stepped up machine gun firing which was pinpointed at their small perimeter behind the beach abutment where the high tide found its mark. Marines were also crouched behind the root base of mangrove trees and coconut palms which had a broad protrusion, and gave good protection from frontal firing. The enemy was not far away. Marines put their heads above the abutment trying to spot the firing of their weapons, but without success. "They must have had muzzle flash suppressors on their machine guns," Few said. "We could almost feel the muzzle blast of their weapons, but could not locate their fire." Corporal Spaulding had been moving up and down the line checking positions and reporting the situation to Captain Ringer. The Captain told him that he had already sent one Marine back for help, but he was afraid he didn't make it. He asked Spaulding if he thought he could get through if they pinned the enemy down with concentrated firing. Spaulding replied that he thought he could. After saying "so-long" to his close buddies on the left flank he took off. The line laid down a heavy barrage. He was on his way. In the water he shed his dungarees and boondockers and started swimming east. When he tired he came ashore and rested, At one point he was walking on the shore and saw a bonfire. He had assumed that he had reached the Marine perimeter, so he approached the bivouac area and almost stumbled onto a group of Japanese soldiers sitting around the glow of the fire talking. Fortunately, he was not seen. He slipped into the water again and made Kukum at 7:30 a.m. Coming ashore he was almost shot by a Marine guard, mistaking him for the enemy. As dawn broke there were only four men left of the Goettge Patrol who were able to fight. At this point Platoon Sergeants Few, Caltrider and Captain Ringer decided to move inland to get the protection of the jungle. They were trapped on the beach and knew they wouldn't survive if they stayed there, The three moved forward about fifteen yards. They motioned to the corporal behind them to move up and join them. In attempting to do so he was cut down by enemy fire. The remaining three dashed forward to several coconut trees for protection. Captain Ringer and Platoon Sergeant Caltrider fell to enemy machine gun fire. 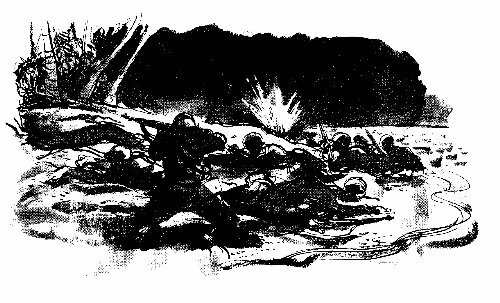 An enemy bullet struck Caltrider's cartridge belt, causing the rest of the ammunition to go off in a series of small explosions. Platoon Sergeant Few was now the sole survivor. He glanced back at the beach and saw a Japanese soldier firing his rifle into the corpses of the fallen Marines. Few rose slowly between four coconut trees, steadied himself and squeezed off a round from his forty-five pistol. The soldier dropped in his tracks. This could have been Sakurai, who was reported killed in the early morning hours near the end of this foray. But for Few this was it. He'd take his chances and try to escape. He might make it. To stay was futile and certain death. One man against an undiselosed number. He took off with all the speed he could muster. He made a bee-line for the beach, shedding his dungaree jacket, then dove into the sea. He peeled off his boondockers and trousers and swam for the open sea as quickly as he could. Japanese infantrymen took positions and began firing at him. Looking back he could see the flashing samarai swords mutilating the corpses of the fallen Marines. The Japanese brought a heavy machine gun to the edge of the beach and commenced firing, They fired to his right and left, then moved to center trying to zero in on him. Few dove under the water and constantly changed his swimming pattern. When he reached the flow of the Matanikau, he could feel the surge of the current taking him out. He was relieved because he was soon out of range. Platoon Sergeant Few had on a pair of silk white Japanese undershorts that he had picked up in an enemy storage shed after landing. He thought sharks were attracted to white, so he tried to take them off, but he couldn't untie the wet cord that held them up, They were silvery white, almost fluorescent, but he could do nothing about it. Few swam the entire distance. Along the way he grabbed a coconut to gain added buoyancy, but it was probably more of a morale booster than anything else. He was a strong swimmer. When he came out of the water at the Marine perimeter he was exhausted. He had also suffered from salt water intake and could not readily respond to a sentry's challenge. He was almost shot. Later he gave a full report of the tragic events that had befallen the patrol to Lieutenant Colonel William Maxwell, Commanding Officer of the First Battalion, Fifth Marines to Major General Vandegrift, the Commanding General. Vandegrift felt this loss very keenly. Some of these men had been his close friends for years and also served in the very vital D-2 and R-3 Intelligence Sections, the hub of operations. There were those among them who had been trained scouts and one officer, who was a competent interpreter in Japanese, had only recently joined the Division. It was a great loss.